Creating bedtime rituals is important and can help bedtime become fun for you and your kids. Here are a few strategies and fun bedtime rituals that may help getting your child off to sleep. For many parents, bedtime becomes a harrowing experience. Kids complain about going to bed, they have to go to the bathroom 5 times before they settle in, or they always need a last drink. In many cases, kids use this to explore their power and to see if you really mean it when you tell them it is time to go to bed. Although bedtime may seem rough right now, creating a few bedtime rituals for you and your children may help. After all, their sleep is very important and you need to keep them on a regular sleep schedule. Instead of making bedtime a battle, the right routine and rituals can make this time special for you and your children. Before taking a look at some of the fun bedtime rituals you can enjoy with your children, there are a number of strategies that you need to learn that will help you eliminate battles and come up with a great bedtime experience that everyone will enjoy. With the following strategies, you can best come up with a routine that is going to work for your children. For us, we ended up with a combination of the bedtime strategies and rituals listed below. – Strategy #1 – Come Up With a Bedtime Plan – The first strategy is to come up with a good bedtime plan. Remember that all children are going to be different. To figure out a good time for bedtime, watch your child to figure out when they are really tired. This way you come up with a good time that isn’t too late or early. Make sure you plan out bedtime before it is late as well. Come up with limits, decide on a routine, and make sure you and your spouse are on the same page when it comes to the bedtime plan. – Strategy #2 – Create a Special Routine – There are a variety of things that can be implemented into a bedtime routine. Create a special routine that will work for you and your children. This can include taking a bath, cuddling together, talking about the day, saying good night prayers, brushing your teeth together, story time, and more. Come up with activities that are enjoyable, and over time your child will become used to their routine, which will start getting them relaxed for bedtime. – Strategy #3 – Decide on a Follow Through Plan – Even with a routine and some rituals for bedtime, kids often still will test their limits. In many cases, kids will try to get out of bed or call out for you again and again, even after the routine is complete. You need to have a plan for how you respond to this. Sometimes kids will test you to see how serious you are about bedtime. Be firm and kind, but don’t come back in more than once. Let them know it is bedtime and you will be leaving. – Strategy #4 – Let Kids Know How Important Sleep Is – Sometimes it can help to let your kids know how important sleep is. Let kids know that their body has to have rest so they can grow and so they have energy. This information is important and helps your child see why bedtime is important. – Strategy #5 – Make Time for Your Children During the Day – Kids often try to vie for the attention of their parents at bedtime because they are not getting enough time with their parents at other times. You can avoid bedtime battles by spending more time with your kids during the day or early in the evening. This way you and your kids both go to bed feeling that you have had plenty of quality time together. Now that you have some good strategies in place to help you create your own routine to eliminate bedtime battles, there are a variety of fun bedtime rituals that you can add into that routine to make it extra special for you and your child. Here are a few fun ideas to try. – Idea #1 – Hugs and Kisses – One idea for a fun bedtime ritual is hugs and kisses. Kids need to feel loved and this time of affection makes them feel special. Give big bear hugs and special kisses to your kids. Eskimo kisses can be fun, as can special family group hugs before bed. 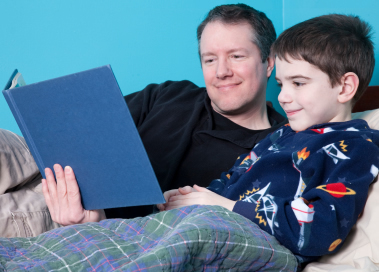 – Idea #2 – Reading a Bedtime Story – Reading kids a bedtime story is a fun bedtime ritual to get into. You can turn this into some time to cuddle with your child as well. Let them pick the book, even if they pick the same one again and again. – Idea #3 – A Bedtime Lullaby – Music is always calming to kids, and a bedtime lullaby is a fun and calming bedtime ritual that many kids enjoy. Come up with a special lullaby just for your child. They’ll enjoy hearing it every night before they drift off to sleep. – Idea #4 – Spread the Love – Not only do kids need physical reminders that you love them, but hearing that you love them is important as well. Start a bedtime ritual where you tell your kids that you love them. This verbal assurance that you love them is important and will help kids feel secure as they go to bed. – Idea #5 – Tuck Your Kids In – Actually taking the time to tuck your kids in under the covers can become a ritual that is fun and comforting. Make sure they are warm under the covers before you leave them to go to sleep. Creating bedtime rituals is important and can help bedtime become fun for you and your kids. Keep these strategies and ritual ideas in mind and come up with your own routine for bedtime that will make your kids feel safe and cherished at night.